In a 2 gallon stainless steel mixing bowl combine all ingredients by gently folding. Refrigerate for 24 hours to allow flavors to marry, fold two or three times to insure that the tomatoes are coated with the liquids. Serve in a chilled ceramic or earthen bowl. The Creole Tomato (Lycopersicon esculentum) is a special strain of tomato that thrives in warm moist climates (that is what South Louisiana sounds like!). Creoles are bright red, meaty, juicy and larger than commercial tomatoes. They usually burst their top by splitting, this makes them look awful, but that is my indication that they are ripe! Availability is usually May through July, and the best come from Belle Chase, LA or from ya backyard. If you haven't had a Creole tomato, you just haven't had a REAL tomato. People bid on the first case produced at the French Market every year, REALLY! Burp-less cucumbers are special cucumbers that are less bitter and have fewer and smaller seeds. Some people think that this is why people have less problems digesting them. Also, they are sometimes called English cucumbers. Steen's Cane Vinegar is my substitution for lemon juice. This is a fantastic product! Steen's Syrup Mill, Inc. P.O. Box 339, 119 N. Main Street, Abbeville, LA 70510 Here is a link to a great review of Steen's Cane Vinegar. Vidalia Onions are internationally known for their sweetness and less acidity. This recipe is MADE for this onion! Southern Grits are my substitution for cracked bulghur or couscous. I did this because a friend of mine is gluten intolerant, so this dish can be eaten by those with this special diet, with no loss of taste! Of course, red pepper flakes give the dish that true South Louisiana flavor! The use of three peppers insures that the flavors are sensed throughout the taste range. The fresh mint gives the dish a cooling and sweet taste, it counteracts the addition of red pepper flakes! OK, so there are more Chef's Notes then there are Method instructions, this needs to be! 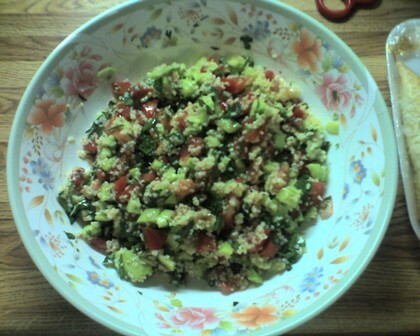 If you follow the Ingredients, you will find how great a Tabouleh this is! Copyright © 1995 -2016 [Aurora Catering, Inc]. All rights reserved.